From Auto Mechanic to Biennale Star: Who was Marino Auriti? Marino Auriti is a retired auto body shop owner with the talent of a cabinet maker, the dreams of an architect and the soul of a philosopher. What we know about Marino Auriti (1891–1980) today comes mostly from the published recollections of his granddaughter, Mary Firmani, and a series of historical documents and contextual material. This essay synthesizes those sources, constructing a portrait of an artist whose life was shaped by such major twentieth-century events as the rise of fascism in Europe, the crash of global markets in the 1920s, and two World Wars. Auriti’s firsthand experiences with the destruction, disorder, and diaspora caused by these century-defining events give a new context for understanding the mission of protection and permanence embodied by Il Palazzo Enciclopedico (The Encyclopedic Palace), an architectural model that has inspired this year’s theme of the Venice Biennale, organized by curator Massimiliano Gioni. Although Firmani is skeptical that Auriti got many commissions for frames in Kennett Square, a town that is still known as “the Mushroom Capital of the World,” Auriti produced many for his own oil paintings, which Firmani describes as copies of “old masters and photographs clipped out of National Geographic.” Auriti hung them cheek by jowl in a salon-style display, and as if that were not enough to set his garage apart from an ordinary mechanic’s shop, another great surprise lurked deep in the garage. As Firmani remembers, “The really cool thing was in the back, beyond the oil-soaked cement ground, the car parts, the enormous chassis of an old, long-out-of-commission car (an Edsel? 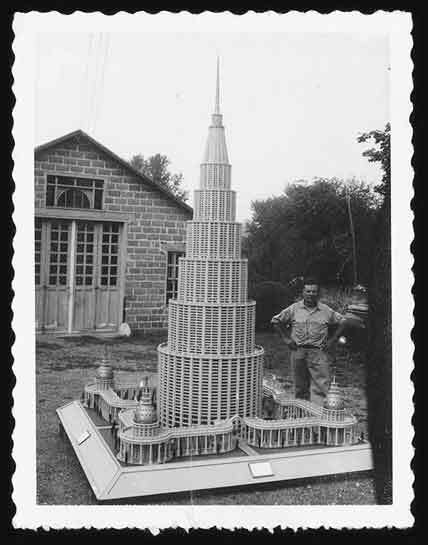 ).” That was where Auriti kept his magnum opus, Il Palazzo Enciclopedico, an architectural model that he created over a period of three years, in the 1950s, after he retired. In his highly technical six-page statement of purpose, Auriti explains the vision behind his unprecedented palace: “This building is an entirely new concept in museums designed to hold all the works of man in whatever field, discoveries made and those which may follow, . . . everything from the wheel to the satellite.” The whole complex, an off-white and bronze wood compound centered around a circular tower composed of eight superimposed circular sections topped by a metal spire, has four arched main entrances, each of them surmounted by an inscription and a flag: Encyclopedic Palace for the United States, Palazzo Enciclopedico for Italy, Palacio Enciclopedico for Spain, and Palais encyclopédique for France. Auriti then goes on to describe the components of the building: It “has twenty-four entrances—eight large and sixteen smaller ones. The interior structure is composed of 144 columns of various sizes: 126 made to support bronze statues of writers, scientists and artists past, present and future.” It includes four twelve-story cupolas that were meant to serve as research laboratories, administrative offices, and restaurants, some of which would convert into auditoria. The piazza is composed of 220 Doric columns topped by aphorism-bearing friezes (with dictums, applied with black transfer letters, such as “Do not abuse generosity”; “Use a budget for everything”; “No one will take away your sins. Don’t commit them”; “The less you desire the greater is your happiness”; “Enjoy liberty but don’t hurt anyone”; “Love your neighbors”) reflecting Auriti’s values. “In the four corners of the garden rise four pedestals on which are placed bronze statues of allegorical figures that represent the four seasons.” Auriti’s painstaking attention to detail and functionality are astounding: on the tower alone, he used clear celluloid to simulate 792 windows and crafted the entrances with swinging metal doors. Auriti built the Palazzo as an architectural model on a scale of one to two hundred. He hoped that it would be fully realized in Washington, DC, where it could join an existing landscape of national monuments. If it had been built, this structure, based on the model that is 11 feet tall by 7 feet in diameter, would have spread across sixteen city blocks, with its central tower reaching 136 stories, or 2,322 feet, into the sky—making it more than four times the height of the Washington Monument. Auriti supposedly wrote letters to parties whom he hoped would break ground on his visionary plan, although evidence of any correspondence does not survive. He even sought an official patent for his invention—a protection that Firmani relates to a bad experience with coffee threshers back in Brazil, where Auriti’s business partner allegedly cheated him by applying for a patent on one of his designs. Il Palazzo Enciclopedico was exhibited at least twice during Auriti’s lifetime: once at the Kennett Square Centennial in 1955, and three years later at the Western Savings Fund Society, a historic bank in downtown Philadelphia. To protect the model when displayed in public, Auriti designed a pyramid-shaped glass-and-metal case made of eighty panes whose rectangular sections measure 28 by 86 inches. Two years before he died, in 1980, Auriti spoke to a reporter at a Wilmington, Delaware, newspaper and expressed a desire to sell the model: “He said he would especially like it placed in a museum or public building, but a large office-building lobby would please him as well.” No buyers materialized at that time, and the Palazzo was deconstructed and put in storage in Newport, Delaware, with one of Auriti’s other models, of a “hilltop cathedral seminary,” his first major architectural model (we know that he built at first a miniature of his house). It remained there for twenty-two years, during which time Firmani and her mother attempted to interest museums and architectural organizations. Among them, the Metropolitan Museum of Art declined the offer, stating “they do not have such objects in their collections.” After many disheartening attempts to place Auriti’s masterpiece, Firmani paid a visit to the American Folk Art Museum in 2002, where she recognized a kindred spirit to the Palazzo in Ralph Fasanella’s Ice Man Crucified #3, a painting in the museum’s collection that was on view in an exhibition. Firmani wrote to the museum, explaining, “My grandfather was a great dreamer and put much love into building it. It gave such pleasure to those who saw it, and it breaks my heart to see it consigned to oblivion.” Shortly thereafter, in January 2003, the museum acquired Auriti’s masterful piece. While the world is still short a full-scale incarnation of Auriti’s Palazzo Enciclopedico, the survival of his model and its current international exposure as the centerpiece of Massimiliano Gioni’s exhibition at the Venice Biennale make for an exciting new chapter in the life of this object. Ironically, Auriti’s work is today recognized on an international stage as precisely the kind of human achievement that he had intended it to house. Source: Katherine Jentleson and Valérie Rousseau, "From Auto Mechanic to Biennale Star: Who Was Marino Auriti?," American Folk Art Museum, June 2013, http://www.folkartmuseum.org/?t=images&id=10725.